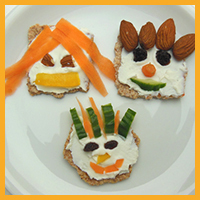 Fancy some simple recipe inspiration to make healthy and delicious easy snacks for kids in a heartbeat? Good! You've come to the right place. 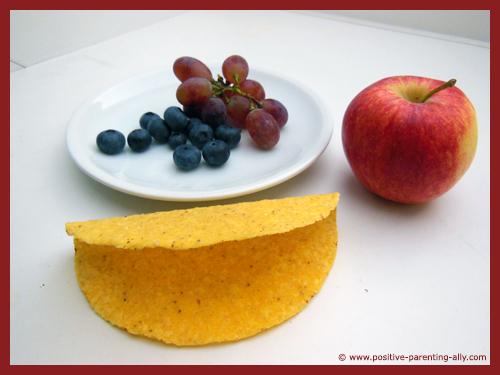 Here on these healthy kids snack pages I will share with you some of the healthy snacks I've prepared for my son when he came home from school peckish and craving something tasty to snack on. Simple - I typically only use a handful of ingredients, often only 2 or 3. Flexible - when it comes to dipping sauce or choice of fruit and vegetables, you can most often easily swop one ingredient out with another to accommodate whatever you have on stock or what your child prefers. Quick - often the preparation time is very short, only a few minutes. However, when making frozen snacks or baked snacks, you do need to calculate with time for freezing or baking. Healthy - When possible I strive to have a good mix of healthy carbohydrates, fats and protein. 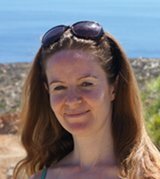 Even though fats and carbs seem to have a bad reputation, we do need them. But luckily we can find fats and carbs in healthy versions that our body loves. Also, you won't find any added refined sugar in these recipes. If I use a sweetener, it will be honey or something similar. Delicious and tasty - Yes, for our kids, this is probably the most important point. 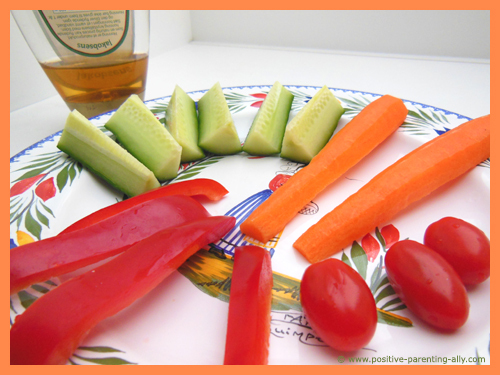 These snacks for kids need to be nothing less than yummy. This healthy easy recipe for kids only contains three ingredients and may take less than a minute to make. How about that? Also this particular kids snack is great on the go as the outer surface is salad and thus isn't greasy. 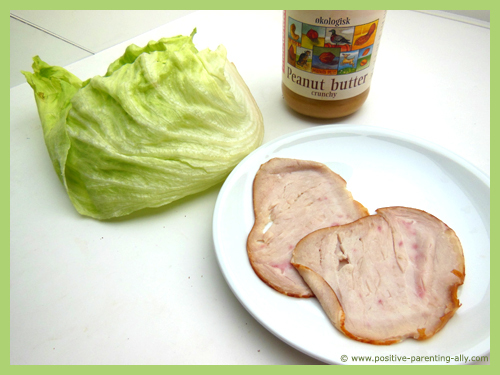 All you need is a couple of lean slices of turkey, peanut butter and a large lettuce leaf. 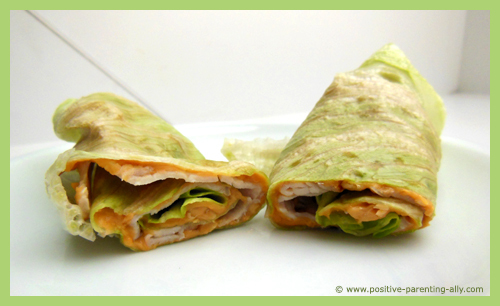 Take the lettuce leaf and spread some peanut butter on it in a thin layer. Place the turkey, or a couple of turkey slices, on top of that. If you want, you can add raisins, or you can always use cream cheese if your child doesn't like peanut butter. This is probably the king of easy snacks for kids. It doesn't really get any easier. And kids love them for their color, different sizes and for their variety. Everybody is happy! Take a look inside you fridge and identify what kind of vegetables you have available today. (As you can see below, I had cucumber, tomatoes, bell pepper and carrots. Not very exotic, but very doable). Take out the ones you would like to serve to your child, and cut them into different shapes that can easily be held by small fingers. Place them decoratively on a plate. 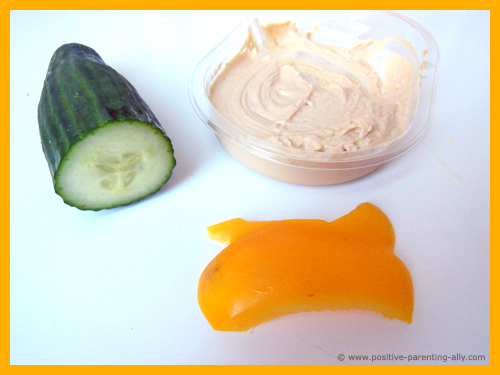 You can always add a bit of delicious, fun dipping sauce for your child, e.g. hummus or water diluted peanut butter or cream cheese. What I mean by diluted is that you simply add water until the consistency is as you want it. 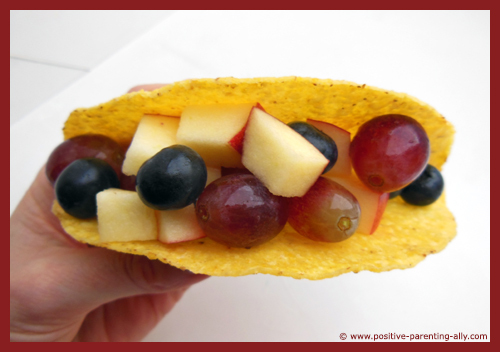 All you need is some hard-shell tortillas and some fruit. The tortilla is technically going to act as a basket for the fruit. The fruit you add is up to you, but to make this even better this kind of easy snacks for kids is ideal for your kids to build themselves. It's no mess. It's just a filling up of whatever fruit you have on stock. As you can see, I had an apple, blueberries and some grapes. 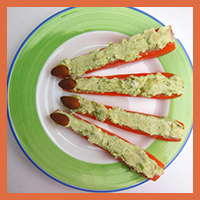 And add some bell pepper pieces as decoration. Have you ever tried homemade crispbread? Homemade crispbread is a prime example of when homemade beats premade by far. The two types of crispbread are so different that it's almost like comparing two different types of food. This healthy recipe for crispbread was given to me by my aunt. 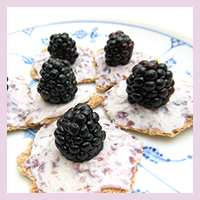 She is also the one who baked the crispbreads you see in the picture below. And they are truly delicious ... also as healthy snacks for kids. The recipe for crispbread contains more ingredients that what you're used to seeing on my easy snacks for kids pages, but if you want to give yourself a healthy treat (and your kids too, of course  ), then follow this recipe. 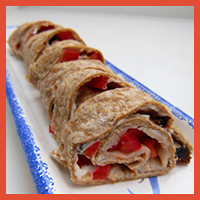 Mix everything together and roll it out on a piece of baking paper. If it is very sticky you can also place a piece of baking paper between the dough and the rolling pin. You can use a pizza cutter to cut out the crispbread before placing the tray in the oven. You bake it in the oven app. 20 minutes at 180 degrees Celsius / 350 Fahrenheit. 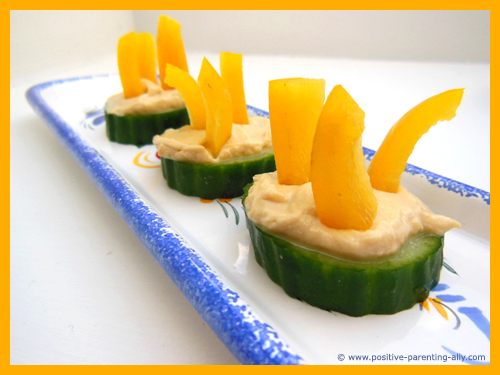 This is an excellent healthy afternoon snack for kids which is also very easy to make. As you may have noticed, except for the crispbread recipe above, I rarely use specific measurements for my snacks. I just sort of go with the flow and pay attention to the consistency. This is the same simple principle that I've use with this kids snack. 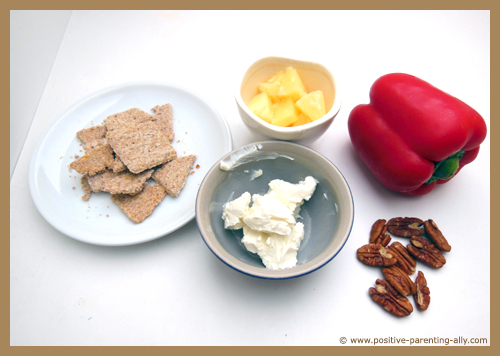 All you need here is some wholegrain crackers (or why not use the delicious crispbreads above), some cream cheese, chopped up bell pepper, nuts (I've used pecan nuts, as you can see) and some pineapple. Just cut out the veg, fruit and nuts. Mix these bits with the cream cheese. You can always add some water, if you find that the cream cheese is a bit too thick. 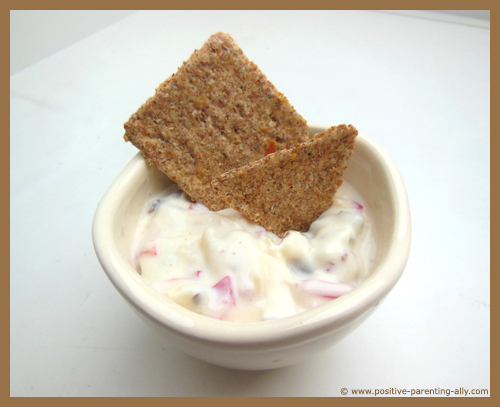 Serve and let your kid dip the crackers / crispbread in the delicious dip. 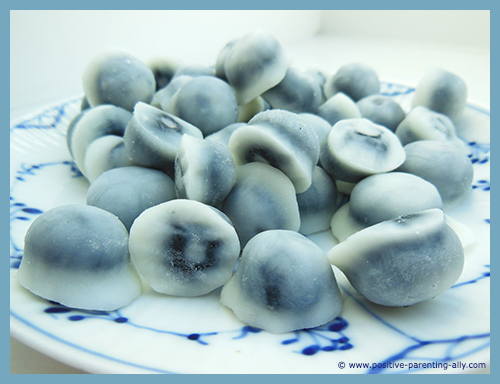 This one of easy snacks for kids is another nominee in the category of simplest snacks ever. 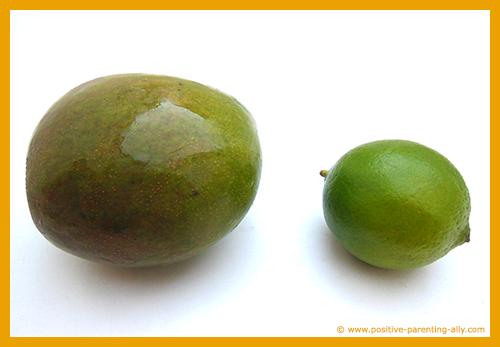 All you need here is a mango and a lime fruit. 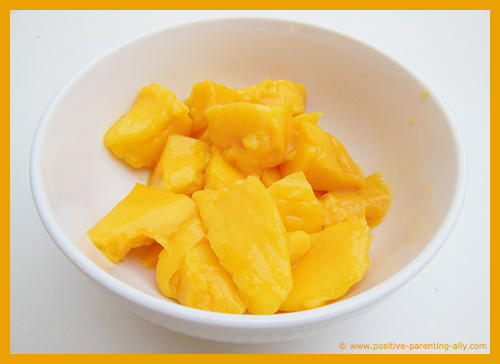 Cut out the mango in small chunks and place a nice portion in a small bowl. Cut the lime in half and squeeze the lime juice out on the mango pieces. That's it - a bit of healthy sweet and sour delight! 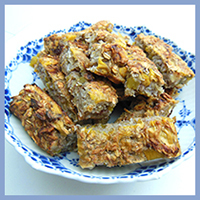 This healthy snacks for kids recipe is one of my son's favorites on this page. Once again, you don't need to measure anything - and it's really very easy to do. All you need is three ingredients: blueberries (you can use other types of berries, too), plain yoghurt and a bit of honey as a natural sweetener. First you pour some yoghurt into a bowl and add a bit of honey. Taste the mixture to make sure, it has the taste you want. 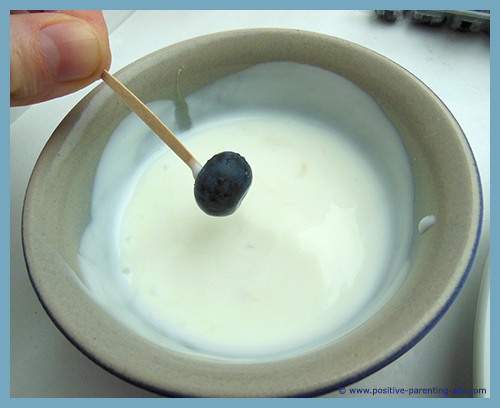 Stick a toothpick into a blueberry and dip it into the yoghurt as shown below. 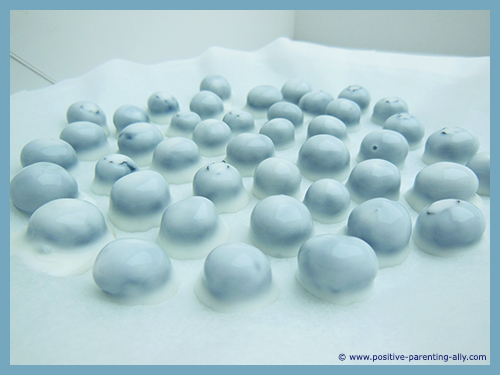 Place the yoghurt covered blueberry on some baking paper. 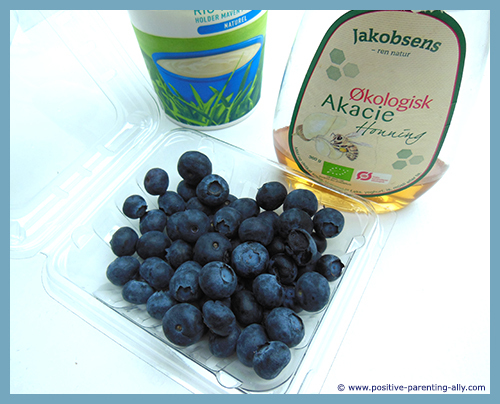 Continue with this until you either run out of blueberries or can't be bothered anymore . Put the blueberries in the freezer until frozen. 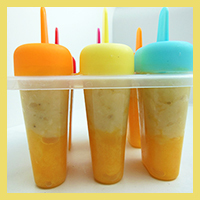 Serve your kids these delicious frozen snacks. 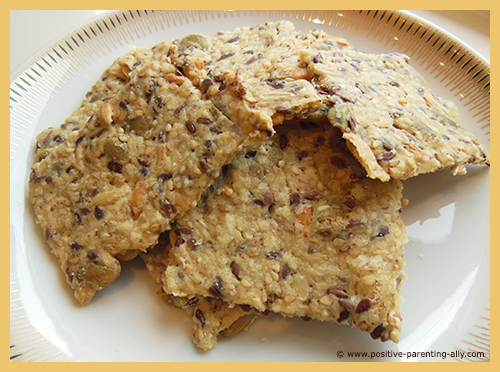 Simply take some wholegrain crackers, and add what your kid likes on top of them. (If you're bold, this could be a chance to introduce new foods like e.g. olives). You can do a turkey and bell pepper pizza. A pepperoni and cucumber pizza. A cream cheese and potato pizza. 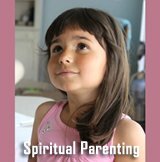 You can also let your kids build their own pizza. Just lay out the ingredients for them and tell them to make something special. 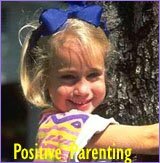 This way they get variety and are more likely to try things they may have otherwise avoided. 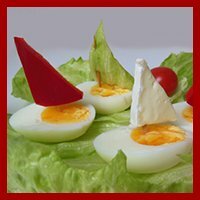 This one of easy snacks for kids will need to be prepared by an adult but they do not take long and are well worth the effort for the reaction you will get from your kids. What you will need is thinly shredded cheese, some veggies like onions, bell paper, tomatoes or whatever you have on stock and two wholegrain tortillas. Put the ingredients on top of the tortilla. Fry lightly in a frying pan with little bit of olive oil until you notice the cheese has melted. Then cut into pieces as you would a pizza and serve. 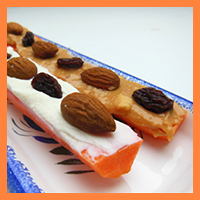 This snack is also very easy and ideal for movie watching with your kids. All you need to do is to pop some popcorn (choose to do it without salt). Once the popcorn have popped and are still hot, cover with parmesan cheese shavings – not too much, just enough to lightly cover the popcorn. And that’s it! 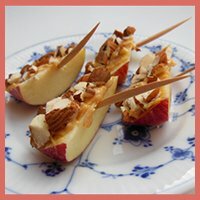 I hope you've enjoyed these recipes for easy snacks for kids. I hope that your kids enjoyed them too. If you want more inspiration to make quick healthy snacks for kids, please dive into one of my other kids snacks articles below.